Red Wing is the county seat of Goodhue County. Red Wing is served by Hiawatha Broadband Communications (HBC) and has had fiber access for almost seven years. In 2009, Red Wing partnered with HBC with the intention of applying for ARRA (American Recovery and Reinvestment Act) funding. Unfortunately, Red Wing was not considered unserved enough to qualify. In 2012, the City of Red Wing and HBC formed a public-private partnership to bring Gigabit broadband to Red Wing. The surrounding communities are catching up to the county seat thanks in part to Minnesota Border-to-Border Broadband grants in 2015 and 2016. Red Wing was a Blandin Broadband Community and through the program they worked to boost broadband adoption. The effort was led locally by Red Wing Ignite, a local organization that is part of a national effort to encourage communities who have Gig access to make good use of it. Red Wing Ignite is an incubator, convener, and supporter of technology in the schools and business community. How is Goodhue County Doing? Red Wing and Goodhue County are thriving. They were a finalist in Deluxe Corporation’s Small Business Revolution – Main Street contest. They were the first rural community to become a US Ignite community. In 2014, they hosted what might be the first rural Hackfest in the US, certainly the first in Minnesota. 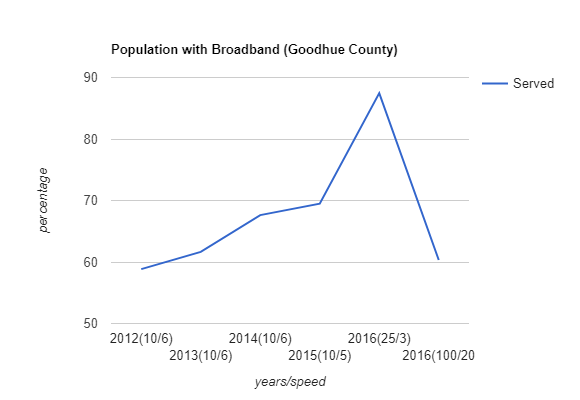 Those numbers are high but keep them in mind when you read the stories below from Goodhue County residents about how broadband keeps businesses in towns and helps promote the community. BIC (pens) has a facility in Red Wing. They need symmetrical access of 300 Mbps. HBC supports that need with fiber-to-the-premise (FTTP). Without those speeds, the BIC facility would have to consider moving or stop growing. Neither option is good for BIC or Goodhue County. Kohlnhofer Farms has sophisticated hog operations, including a network between buildings with cameras and other monitoring of the hogs. They use a combination of fiber and HBC’s Air Wireless service that provide the bandwidth and mobility they need to track the animals. Less staff time is spent monitoring hogs and it is easier to track the markets, ensuring the sell at the right time. Before 2016, educators were required to physically show up for work, even on Snow Days, to get work credit. Now when school is canceled due to weather, Red Wing educators can work on professional development from the comfort and safety of their own home. No time loss for them, increased safety, and easier work/life balance for teachers who are also parents. Xcel Energy has three facilities in Red Wing, two plants and an operations center. Broadband keeps everyone working reliably. Field staff are now using tablets, which means immediate updates on outages and upgrades. They couldn’t operate without a reliable and fast broadband connection, and broadband access is a key piece of any disaster recovery plan. Red Wing was a finalist in Deluxe Corporation’s Small Business Revolution – Main Street contest. Out of 14,000 cities nominated, Red Wing was one of five cities in the final push to win the $500,000 revitalization package. While they didn’t win, it was an opportunity to bring the community together to promote a singular message. Voting happened online. The community rallied. People shared on social media. The local newspapers promoted the story. One older woman went to the library to learn how to get online to vote for her community. Estimated value of the marketing involved in becomes a finalist is $1 million.